Take a shower. Boil pasta. Wash your clothes. Now imagine that the water from your tap is so poisonous as to cause rashes, sickness, neurological damage for you and generations to come. Imagine if your city's unelected Emergency Manager is responsible for policy changes that led to this disaster. That the Governor who installed this manager is only, just now, after years of red flags and protest beginning to act with efficacy. But that's still a maybe. Now imagine that you're being charged top dollar for this poisoned water, and the Governor has said nothing about billing relief or refunds. That you're forced to protest in front of city hall for a shutoff moratorium, that even outsiders felt compelled to start and share a Change.org petition imploring the Governor to stop this criminality. 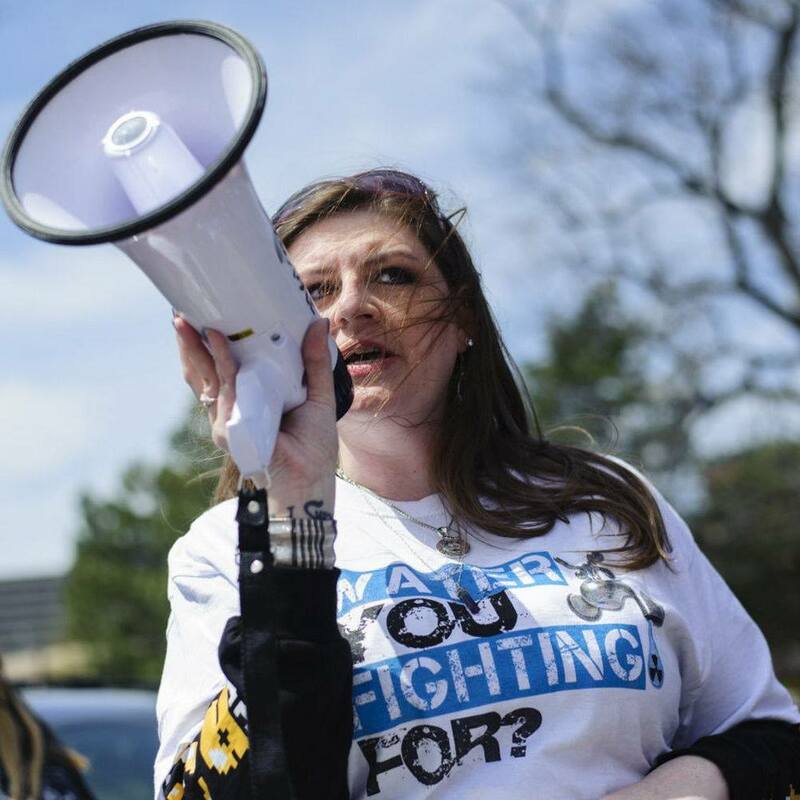 These are just a few of the dire circumstances Flint resident and founder of Water You Fighting For Melissa Mays contends with every day. I corresponded with Melissa via email to find out more about her experience and what she's been doing on the ground to fight for clean water. Melissa is one of the heroes of this struggle, long fighting for justice, and not giving up despite many times feeling alone and unheard as the powerful tried to silence the truth. Tell us about yourself and how long you've lived in Flint. I'm 37, married for 19.5 years and we have 3 sons, 11, 12 & 17. My job at the time transferred us to Michigan in 2001 and we bought a home in Flint in 2002. I love it here. Everyone is so unique and there's such a fighter-spirit here. It's what saved us!! When did you first know something was wrong with the water? What did you do? We first started to notice our water was discolored in July of 2014. We started developing rashes on our skin, especially our faces in August of 2014. We were informed on the last of THREE e-coli boil advisories in September of 2014. That's when we started drinking bottled water. We still cooked with it until January of 2015. The City told us this was safe. We had no idea about the TTHMs (cancer-causing chlorine byproducts) or that lead was spiking in the water because the state did not alert us. When we finally received our first Safe Drinking Water Act violation notification in January of 2015, we'd had enough. We found out that our water had been dangerous for nine months and they didn't tell us!! Still no notice about the lead at this point. We started protesting: marching, doing research and holding informational rallies. We were not going to put up with it anymore. Citizens had been complaining of brown water, hair loss, rashes and foul-smelling water for seven months at that point. They told us it was safe, but we knew better. A lot of people were unaware so my husband and I started a website www.wateryoufightingfor.com to inform citizens of the research we were receiving from Erin Brockovich, Robert Bowcock, Lois Gibbs and more. That's how our activism began -- the website as well as on the streets. In March 2015 residents' lead tests began coming back high. We went door-to-door to 4000 homes to put information on doors to warn the residents that the water was not safe. People deserved the truth. How do you cope with the poisoned water? How has your life changed? Your skin can absorb contaminants, but you can also inhale it through steam. Unfortunately, we still have to shower with the contaminated water and do laundry and dishes. Our kids are not allowed to shower, they have to sit down in the tub without letting it fill up and fill a large cup of water to dump it over their heads to bathe. I can't risk exposing them to steam. The vent must be on and the window up. I have to protect my kids and lower their exposure. As for the laundry, we're stuck. The contaminants stay in the fabrics and rub on your skin all day, then if you sweat in your sheets at night, you're exposed all over again. My kids are not allowed near the dishwasher after it's done running if it's hot because I don't know what is all in our water, so I don't know what is all in the steam. Frankly, no one can tell me with enough certainty that any use of our water is safe, so we do everything to avoid it. We ration our bottled water throughout the day. Sometimes I cannot make soup or fresh vegetables if I run out of bottled water because we cannot use our tap. Our pets get bottled water because our cat almost died in 2014 from the water. He couldn't stop throwing up and his fur fell out in clumps. Once we switched to bottles that stopped. We cannot bathe our dogs because they instantly break out in rashes you can see through their fur. It's awful! And why don't we move? Well, it is illegal to sell your home with a known copper and lead problem. And who would buy my poison water house anyway? We have no options. How much are your water bills? How long have you been paying for poisoned water? How much do you estimate your expenses from this catastrophe to be? We have an $880 balance on our bills. We used to pay $80/month for full use of our water. It has gone up into over $300 or more. Plus we spend $200 on bottled water on top of it. We also pay for detox medications and special food to help our sons try to mitigate the exposure to lead, which are $300-$400 or more per month. We've done everything we can to help our sons try to heal and work with the damage that has been done. Vitamins, healthy foods, bottled water, tutors and everything we never have had to buy before is the reason why I work full-time and my husband has two jobs. We have also lost a garbage disposal and are on our 3rd water heater in 14 months. They burn up because of the contamination and sediment in our water. That's $500 a piece. Honestly, I have no idea how much this has and will cost us. How do you put a price tag on your kids' brains, bones and futures? It's infuriating but we funnel it into the fight. I'm trying to teach our sons that even though someone did this to us, we're not victims, we're fighters. I want to teach them to be strong and stand up against what is wrong, not matter how much it seems like David and Goliath. What's it like to be in Flint right now? We feel like we're in a war zone. State Police and the National Guard are going street to street yet people don't have water. We're afraid of our taps. Instead of talking about activities and fun stuff, we talk about medical problems and how to get water. This is just awful. Any bit of life is being sucked out of us because of decisions politicians who don't live here or care made FOR us. We have felt alone for so long but we fought together. Flint has a rich history of fighters and starting movements, like the sit-down strike, housing and civil rights. I love this city and Flint is definitely worth fighting for. What do you think people should know about Flint that maybe they don't? These changes were actually forced by the citizens. We not only brought awareness to this crime by doing research, protesting, holding rallies, and doing social media blitzes (I'm @FlintGate on Twitter), we banded together to form the Coalition for Clean Water and hired Attorney Trachelle Young to file injunctions starting in April of 2015 to get us off of the Flint River following our City Council vote for that exact thing getting overturned by the Emergency Manager and Governor in March of 2015. I started marching with true Water Warriors from Detroit, Highland Park, Pontiac and more in May of 2015. I joined forced with Detroit legends in the People's Water Board, We the People Detroit, Michigan Welfare Rights Organization, MiCats and more! In July, we held a Detroit to Flint Water Justice Journey: 70 miles of education and awareness that all of our water crises are linked. These heroes are also parents who have families hit by the "water wars" going on here in Michigan. This got a lot of attention and I worked with Lynna Kaucheck from Food & Water Watch to get 26,865 signatures for a petition to get us off the Flint River water, which was immediately dismissed by our former Mayor. We supported the current mayor, Karen Weaver, who has been a champion for us since she took office Nov 9, 2015. We also worked directly with Curt Guyette from the ACLU of Michigan and Professor Edwards and his team from Virginia Tech to conduct the Citizen Science testing in August and September of 2015. He shipped us 300 kits and we got them all out and returned 277. This testing proved that there was a widespread lead problem in Flint, which we had been screaming about since March. Without the citizen focus, dedication and sacrifice, no one would have looked into the lead problem and helped us validate what the citizens were suffering through. We proved that everyday parents and citizens who never met before can team up and force change. What do you want to see happen next? I'm working with State Legislature to help 11 water bills get passed into law. This would make what is happening to Flint a crime in black and white. It will also help all cities with a true affordability plan so no one ever has to choose paying a water bill over food, shutoff protection plans for the most vulnerable citizens, and a water testing and notification law that will make it illegal for the state or a city to wait 9 months before notifying people of problems with the water. There is also a Water Accountability package that will make what happened to Flint punishable by law. I am also a part of four federal lawsuits to put a stop to the shutoffs so people don't lose their kids because they cannot afford $200/mth or more for poison water; a class action lawsuit demanding damages for what was done to us including personal, property and physical harm as well as a medical monitoring fund for everyone affected by the water; and a lawsuit with the Natural Resourced Defense Council, ACLU of Michigan, Concerned Pastors and myself to demand federal court oversight over the MDEQ to force them to follow proper EPA protocol for testing and monitoring. More can be found out about the class action lawsuit at www.flintwaterclassaction.com. I am especially excited because we just served Governor Snyder with subpoenas for all his correspondence about Flint Water since 2011. I'm hoping the truth comes out so we can be an example of what NOT to do with water systems. We don't want any other parent to suffer through what we're going through. No child should ever be harmed by what comes out of their tap water. Governor Snyder needs to direct the correct funding to us to replace our destroyed infrastructure. This has gone on too long. We also need medical, educational and emotional support because this has been devastating. We shouldn't have to push through this alone anymore and those responsible need to stand up and help. The Emergency Manager Law is obviously a complete failure of democracy and needs to be repealed and the Governor, and everyone responsible, needs to be out of office immediately. They are obviously not fit to oversee anyone as all they have shown us is a complete disregard for human life and safety. There needs to be severe consequences for their actions and INACTIONS as they have destroyed the futures for Flint residents, all to save a little money. They need to answer to the crimes they inflicted upon every man, woman and child in this city.